Learn more about the Lorex 8 Channel Security Camera System with 6 HD Surveillance Cameras. Get pricing, and answers to common questions. The Lorex 8 Channel Security Camera System with 6 HD Surveillance Cameras features color night vision, a 4MP image sensor, and six 2k video resolution security cameras. This Lorex security system's HD quality monitoring and 90° camera lens offer broad fields of view that will capture useful evidence in the event of an incident. 6 bullet 2K 4MP IP cameras. 150 ft. color night vision. Pros: Superb resolution and frame rates, and 32 available channels. Cons: Online technical support could improve their response times. Bottomline: Comprehensive security solution that offers peace of mind when you and your family are away from home. What are some alternatives to the Lorex 8 Channel Security Camera System with 6 HD Surveillance Cameras? 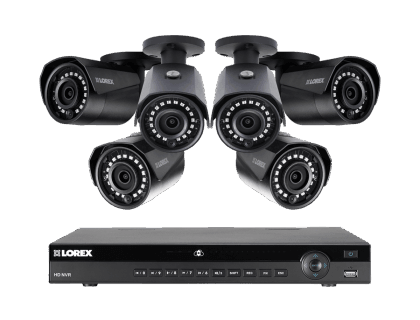 Where can I buy the Lorex 8 Channel Security Camera System with 6 HD Surveillance Cameras security camera system? The Lorex 8 Channel Security Camera System with 6 HD Surveillance Cameras security camera system is available via Amazon and the Lorex website. Does the Lorex 8 Channel Security Camera System with 6 HD Surveillance Cameras work at night? Yes. The Lorex 8 Channel Security Camera System with 6 HD Surveillance Cameras features color night vision (CNV) technology that can see up to 150ft in ambient lighting with 2k resolution. Can the Lorex 8 Channel Security Camera System with 6 HD Surveillance Cameras be used in any weather? Yes, the Lorex 8 Channel Security Camera System with 6 HD Surveillance Cameras has IP66 weatherproof ratings, and can be used in any weather. The combination of heavy duty metal casings and vandal proof designs offer greater outdoor protection and can operate in extreme temperatures, ranging from -22 °F to 140 °F.